ZAKARY THAKS-IT’S THE END-THE DEFINITIVE COLLECTION. During the sixties, garage bands sprung up all over Texas. Some recorded a handful of singles, before disappearing. Others never got that far. Most recorded just the one single, and played a handful of gigs, before calling it a day. They’re long forgotten, having played just a walk-on part in the history of Texan garage rock. However, fifty years later, one name looms large in the history of Texan garage rock, Zakary Thaks. They’re now regarded as the Kings of Texan garage rock. That’s why recently, Big Beat, an imprint of Ace Records, released It’s The End-The Definitive Collection, a twenty-two track compilation of Zakary Thaks’ music. Their story began fifty years ago. The Zakary Thaks story began in the early sixties, in Corpus Christi, Texas. That’s where, one summer, a group of school friends decided to form a band. This wasn’t unusual. Groups sprung up on a regular basis in the port of Corpus Christi. Nobody took any notice when a new band was formed. After all, groups came and went. The Riptides were just the latest rock ’n’ roll group to be formed in Corpus Christi. It was at the home of guitarist Pete Stinson, that The Riptides were formed. The initial lineup featured vocalist Chris Gerniottis, drummer Rex Gregory, bassist Wayne Harrison and guitarists Pete Stinson, Shelby Jordan and Glenn Jauer. This was the lineup of The Riptides that played at local parties. Not long after The Riptides formed, they changed their name. There was, a well known surf rock band with the same name. So, The Riptides became The Marauders, who were soon, establishing a reputation as one of Corpus Christi’s best up-and-coming band. When The Marauders played live, their music was influenced by the recent British Invasion. Initially, it was just The Beatles that influenced The Marauders. Soon, they discovered The Kinks and The Yarbirds. Their driving rock sound appealed to The Marauders. It played a huge part in shaping The Marauders’ sound. So did blues, rock and surf rock. That’s not surprising. Corpus Christi was a popular surf resort, and The Marauders were on their way to becoming one of its most popular bands. Especially with a new guitarist, John Lopez, onboard. John Lopez had no formal guitar lessons. A self-taught guitarist, his playing style is remembered as fiery. It was a case of John taming the tiger that was his guitar. With the flamboyant guitarist onboard, The Marauders dispensed with instrumentals and instead, relied more upon Chris Gerniottis’ vocals. This proved a minor masterstroke. With each performance Chris’ confidence grew. He was inspired by the the Rolling Stones’ Mick Jagger and Eric Burdon of The Animals. However, it was Keith Yelf of The Yarbirds that Chris modelled himself on. Things it seemed, were looking up for The Marauders. Then Rex Gregory had to leave the band. Rex hadn’t been doing well at school. So, his father took him out of school, and sent him to Houston. This left The Marauders without a drummer. His replacement was David Fore. He was a better fit. While Rex was essentially a jazz drummer, David was more suited to garage rock. David was what The Marauders had been looking for. Maybe he was the final piece in the jigsaw? That looked like being the case. Then a few months later, Rex returned. This presented The Marauders with a dilemma. David was a better drummer. They couldn’t get rid of him. So, they offered Rex the chance to become The Marauders’ bassist. Rex agreed. However, nobody thought to tell Wayne Harrison. The first he knew, was when he arrived at their concert at The Carousel. Wayne wasn’t pleased, and decided to leave The Marauders, who were about to change their name again. Having been first The Riptides and then The Marauders, at last, the group were going to settle on a name. This came about when Chris Gerniottis was reading a teen magazine. In the letters page, he came across the name Zakary Thaks. It sounded much better than The Marauders. There was an air mystery and intrigue to Zakary Thaks. This change of name coincided with a change in fortune for Zakary Thaks. With their new name, things started to look up for Zakary Thaks. The Carousel, where Rex made his debut on bass, became their new headquarters. Zakary Thaks became ostensibly the house band, playing at dances. Quickly, their popularity grew, with Zakary Thaks appearing on a local television show, Teen Time. It was at Teen Time that Zakary Thaks discovered what was definitely, the final piece of the musical jigsaw. That was Stan Moore. He was the drummer for a rival group The Last Fyve, when Zakary Thaks first heard him play. Straight away, they realised he was what Zakary Thaks had been looking for. Although David Fore was a good drummer, Stan Moore was better. Chris and the rest of Zakary Thaks knew the importance of a good drummer. The rhythm section was central to the future success of Zakary Thaks. Stan Moore could improve Zakary Thaks’ rhythm section. So, an approach was made to Stan Moore, and he became Zakary Thaks’ new drummer. At last, the final piece in the jigsaw was in place. Now, Zakary Thaks were set to become Kings of Texan garage rock. With their new drummer in place, Zakary Thaks style continued to evolve. Folk-rock and blue-eyed soul influenced Zakary Thaks. Among the groups influencing Zakary Thaks, were The Byrds and The Young Rascals. With their constantly evolving set list, Zakary Thaks took part in a battle of bands at The Carousel. Given The Carousel was Zakary Thaks unofficial headquarters, they didn’t want to loose face on their home turf. They didn’t. Instead, Zakary Thaks were approached by Carl Becker, who worked with a small airline. Carl and his brother-in-law Jack Salyers had setup J-Beck Records and wanted tor to manage Zakary Thaks. Part of the deal included Zakary Thaks making their debut recording. An added bonus was that Carl and Jack promoted concerts, and would be able to get Zakary Thaks regular gigs. After consulting their parents, Zakary Thaks agreed, and the next step in the rise of Zakary Thaks began. Realising that Zakary Thaks were bristling with energy and enthusiasm, Carl and Jack soon got the band regular bookings. Zakary Thaks were well received by the audience. They were obviously a talented band. So, soon, Carl and Jack suggested Zakary Thaks write their debut single. 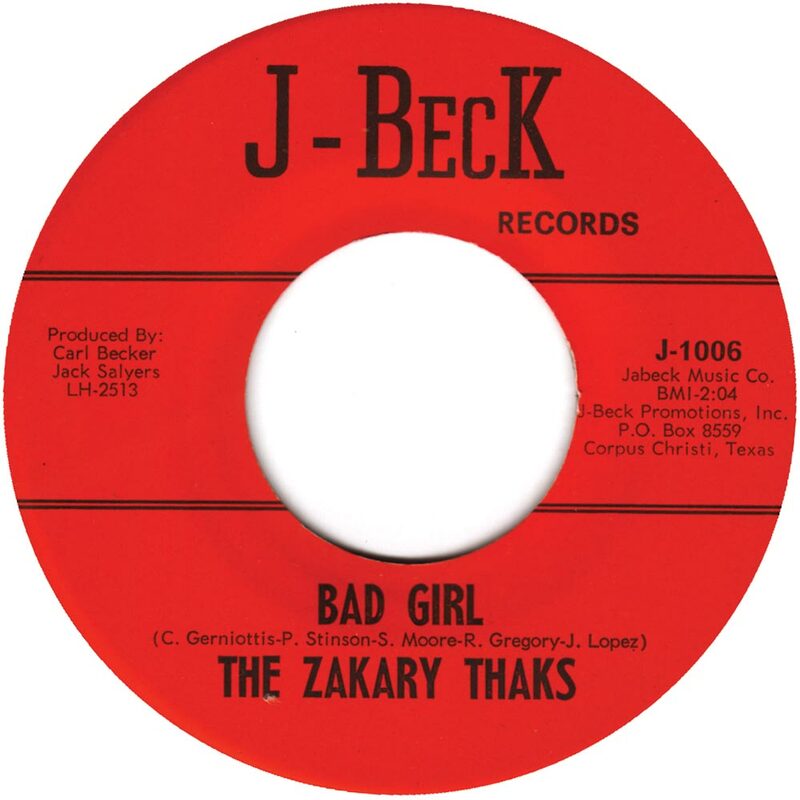 After some time, Zakary Thaks returned with what would become their debut single, Bad Girl. Fittingly, given Zakary Thaks’ love of the British music, the B-Side was a cover of The Kinks’ I Need You. Both tracks feature on It’s The End-The Definitive Collection, which documents the musical history of Zakary Thaks. Their recording career began in mid-1966. Bad Girl was released on J-Beck Records in mid-1966. Bad Girl, an explosion of teenage angst, that’s influenced by the British Invasion, struck a nerve. It became a local hit in Texas. It hit the top of the charts just at the right time. By then, Zakary Thaks had just supported The Seeds. The Seeds were in disarray, and were blown away by Zakary Thaks. Despite this, The Seeds’ lead singer, Mike Taylor, would later write Zakary Thaks’ sophomore single Please Me. Before that, Zakary Thaks played at a battle of the bands at the Aqua Festival, in Austin, Texas. By then, Zakary Thaks’ star in the ascendancy. Now was the time to record the followup to Bad Girl. Carl Becker took Zakary Thaks to Gold Star studios, Houston. That’s where recording of Zakary Thaks’ sophomore single Please took place. With its folk rock sound, Please was a stylistic departure for Zakary Thaks. This change of style didn’t please the members of Zakary Thaks. Mike Taylor, who was now working alongside Carl, convinced Chris this was the way to go. He acquiesced and Please, with Won’t Come Back on the B-Side became Zakary Thaks’ sophomore single. Please didn’t quite replicate the success of Bad Girl. Inwardly, Zakary Thaks thought they’d released the wrong song. At the same session, they had recorded two rocky tracks, She’s Got You and It’s The End. Both were penned by members of Zakary Thaks. Again, there’s a strong British Invasion influence, as Chris oozing attitude, and accompanied by a moody, rocky backdrop, struts his way though the track. Despite these blistering performances, both tracks were rejected by Carl Becker, who was currently negotiating with Mercury Records. After the success of Bad Girl locally, Chris decided to lease the single to a major label. Eventually, after some contractual problems, he struck a deal with Mercury. Bad Girl was released by Mercury in October 1966. Due to the nationwide release of Bad Girl, Carl put a followup single on hold. By then, Zakary Thaks had met one of their musical heroes. The Yarbirds were on what became their last American tour, before Jeff Beck quit the group. On 30th October 1966, The Yarbirds played at Corpus Christi, at the Memorial Coliseum. Somehow, Carl had convinced the promoter to let Zakary Thaks open the bill. The next day, at the airport Zakary Thaks, who were en route to Houston, to a recording session, met Jeck Beck. Having met their hero, Zakary Thaks boarded a flight to Houston. At Gold Star studios, Houston, Zakary Thaks recorded Passage To India, which was very different to their previous recordings. Its modal, Eastern influenced riffs were almost a homage to The Seeds. Other tracks recorded at the Gold Star sessions, included Won’t Come Back and Face To Face. Once the recording sessions were over, Zakary Thaks returned home. With three new tracks to show for their trip to Houston, Zakary Thaks hoped one would be their third single. That wasn’t to be. Carl Becker rejected the songs. However, after Face To Face was reworked in late December 1966, and then January 1967. With Carl’s help, Zakary Thaks nailed Face To Face. It would give Zakary Thaks’ another hit single. 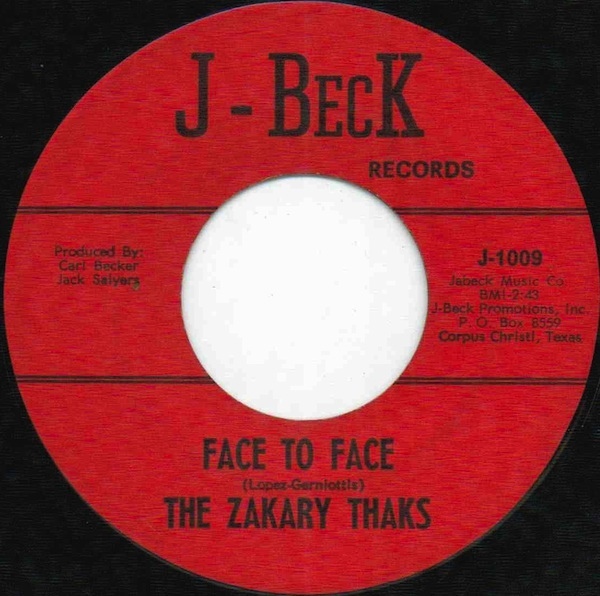 Released in February 1967, Zakary Thaks’ long awaited third single, Face To Face, which had Weekday Blues on the flip side, caught the attention of DJs. Across the Gulf Coast, Face To Face received heavy airplay. However, during this period, members of Zakary Thaks’ rhythm section were working overtime. Following his departure from The Seeds, Mike Taylor was touring as Michael. There was a problem. He was without a band. So, when he needed a rhythm section, who did he call? Zakary Thaks. They accompanied him live, and played on three recordings that feature on It’s The End-The Definitive Collection, I’d Only Laugh, People Sec IV and Gotta Make My Heart Turn Away. Of this trio of tracks, the Dylan tonged People Sec IV, was released as a single. Meanwhile, Face To Face, Zakary Thaks’ was riding high in the charts. With another hit single in Face To Face, featuring on television, constantly playing live and working with Mike Taylor, things were looking good for Zakary Thaks during the first half of 1967. To onlookers, this was pretty good going, considering Zakary Thaks were still in their final year at high school. However, Zakary Thaks’ next single marked a change in the group’s fortunes. By June 1967, Zakary Thaks released their next single. This wasn’t a new song. Won’t Come Back had been recorded at Gold Star Studios, in December 1966. It was paired with a rerecorded version of their debut hit single, Please. However, it failed to match the commercial success of Face To Face. This was a huge disappointment. Still, Zakary Thaks were busy playing live, appeared on television and even had a documentary made about them. Then in the spring 1967, Carl Becker announced he was leaving J-Beck Records. For Zakary Thaks this was a worrying time. Lofton Kline, formerly of The Poco-Seco Singers took over A&R duties for Zakary Thaks. This resulted in a change of sound. Zakary Thaks’ releases took on a more polished sound. Instruments were layered, and the production style was much more noticeable. This is apparent on Zakary Thaks’ final single for J-Beck Records. Recording of the Mike Taylor penned, Can You Hear Your Daddy’s Footsteps began in April 1967. Then when Lofton took charge of A&R, he decided that overdubbing should take place. It was well worth the extra effort. The vocal arrangement, where harmonies interact with the lead vocal, is much more complex. Then there’s the blistering guitars, and driving rhythm section. On the B-Side was the reflective, baroque influenced Mirror Of Yesterday. With its heavily orchestrated arrangement, this marked a change in style from Zakary Thaks. This wasn’t the only change about to happen. Little did one of their number realise, that Can You Hear Your Daddy’s Footsteps was their Zakary Thaks’ swansong. Eventually, Can You Hear Your Daddy’s footsteps was released in November 1967. It failed to replicate the commercial succes of earlier singles. Zakary Thaks’ recording career seemed to have stalled. Maybe, the loss of Chris Becker had affected Zakary Thaks more than they realised? Lofton, although well intentioned, maybe, seemed to be taking Zakary Thaks in the wrong direction? Then there was a problem with Chris Gerniottis. For some time, there had been tension within Zakary Thaks. Eventually, it came to a head in January 1967. John Lopez, Stan Moore and Pete Stinson decided the time had come to fire Chris Gerniottis. Chris seemingly a believer in the maxim get your retaliation in first, joined Zakary Thaks’ fiercest rivals Liberty Bell. Zakary Thaks. Replacing Chris in Zakary Thaks was Maxine Sands. However, her time as Zakary Thaks lead singer was short-lived. Pete Stinson joined the U.S. Army and Zakary Thaks split-up. Can You Hear Your Daddy’s Footsteps proved to be Zachary Thaks’ final single for J-Beck Records. There was subsequent talk of the remaining members of Zakary Thaks forming a new band. However, John Lopez joined The Farm. He played with The Farm until Zakary Thaks reformed in May 1968 as a trio. This being the age of the power trio, drummer Stan Moore, bassist Rex Gregory and guitarist John Lopez became the latest incarnation of Zakary Thaks. Not long after reforming, Zakary Thaks released a new single, Green Crystal Ties, which featured My Door on the B-Side. Both sides were psychedelic rockers, and despite their indisputable quality, failed commercially. For the newly reformed Zakary Thaks, this was a disappointment. Maybe their luck would change when they became a quartet? Liberty Bell disbanded in January 1969. This left Chris Gerniottis without a group. Differences were put to one side, and Chris Gerniottis rejoined Zakary Thaks. With three becoming four, Zakary Thaks signed to Carl Becker’s new label Cee Bee Records. In March 1969, Zakary Thaks recorded what would prove to be the final single of their career. Originally, Everybody Wants To Be Somebody was destined to be the single. 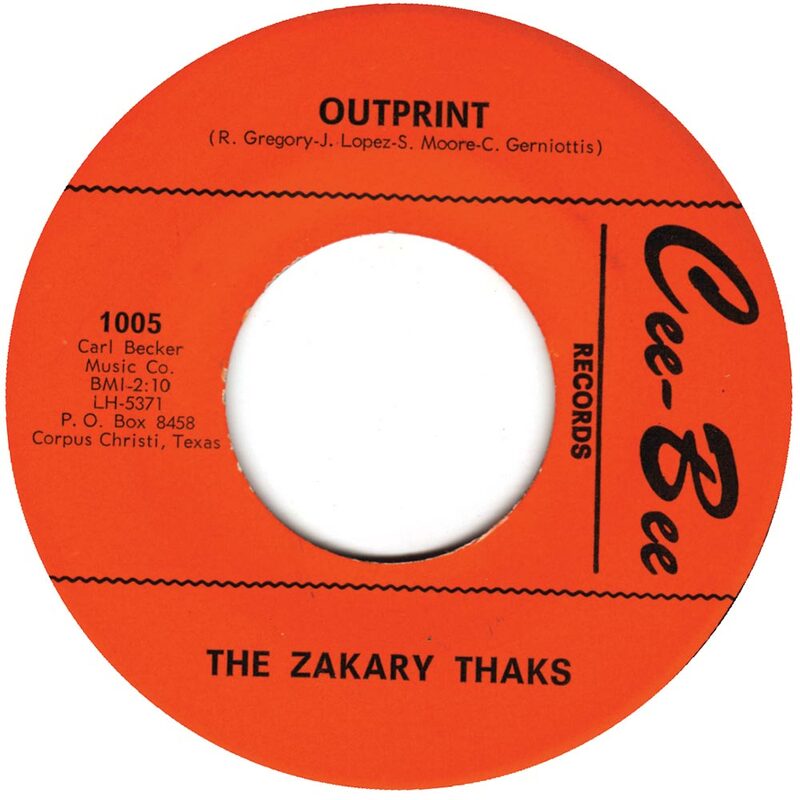 However, the B-Side Outprint had more of the original Zakary Thaks’ sound. Sadly, that proved to be wishful thinking. Zakary Thaks sunk without trace. 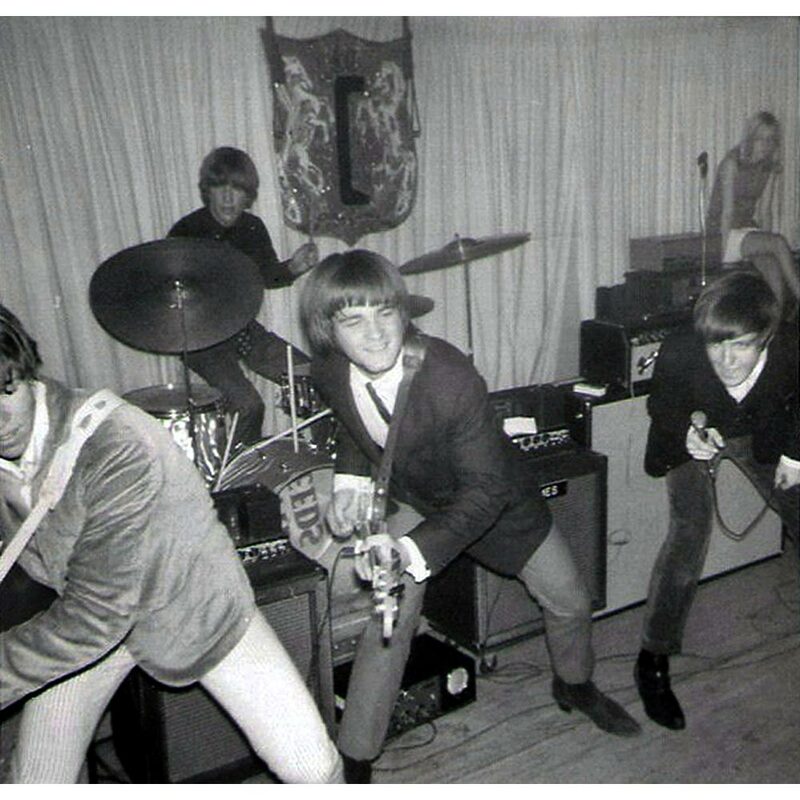 The group that had been, Kings of Texan garage rock split up in June 1969. The dream may have been over for Zakary Thaks, but they had written their way into garage rock history. Thirty-six years after Zakary Thaks split-up, they’re still remembered as Kings of Texan garage rock. That’s despite releasing six singles. Three of these singles, Bad Girl, Face To Face and Won’t You Come Back are remembered as Texan garage rock classics. They’re a tantalising reminder of just what Zakary Thaks were capable of. However, there’s more to Zakary Thaks than three singles. It’s The End-The Definitive Collection, a twenty-two track compilation of Zakary Thaks’ music, released recently by Big Beat, an imprint of Ace Records is the most comprehensive compilation of Zakary Thaks’ music. It features singles, B-Sides, alternate takes, rarities and unreleased tracks. This makes It’s The End-The Definitive Collection, the perfect introduction to Kings of Texan garage rock, Zakary Thaks. ← GEORGE JACKSON AND DAN GREER AT GOLDWAX.